Unfortunately, a sudden blaze can develop so quickly that it engulfs an entire property and traps people inside. That was the case in a recent incident involving one human victim and two animals. Despite the best efforts of first responders, all three of those victims were claimed in the house fire, the cause of which is not yet known. A Cranford house fire led to fatalities for two dogs and a resident. The blaze happened near Brookside Place as a passerby reported the fire just after 6 o’ clock in the morning. The heavy fire conditions encountered by the responding fire crews required an offensive fire response in order to curb the flames. Additionally, Union County fire crews were on the scene to help control the blaze. Family members were recently being identified on behalf of an injured party and police officers were not going to release the name of the victim until those family members could be informed. According to the investigation however, the victim was an elderly woman and investigators who arrived on the scene said they were not yet sure what would have sparked the blaze. Ultimately the home was left uninhabitable. The police officers on the scene did share that there was nothing criminal or suspicious at this time. Anyone who is lucky enough to survive a fire incident may have catastrophic burns and other serious injuries. 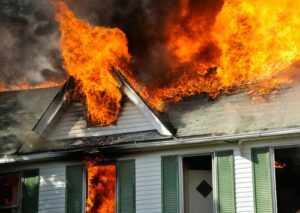 If a fire was caused by someone else’s negligence such as a landlord who installed faulty electrical wiring or a defective product that suddenly caught on fire, an injury lawsuit may be filed on behalf of the injured party. Costly medical expenses, missed time at work and other damages are often tied to these accidents prompting people to hire a personal injury lawyer at Blume, Forte, Fried, Zerres, & Molinari to fight back.